and will no longer be a bed & breakfast. 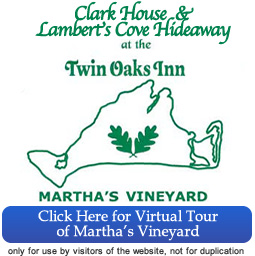 The Clark House, is a classic home style Bed and Breakfast just a 10 minute walk, or 2 minute bus/car ride from the Steamship Authority Terminal in Vineyard Haven. 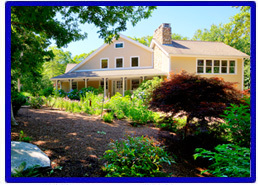 The Lambert's Cove Hideaway, is a beautiful secluded home in the desirable neighborhood of Lambert's Cove, and is a short car/taxi/UBER ride from the same Terminal. 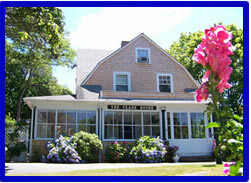 Both locations are a short distance from the downtown Vineyard Haven with shopping, restaurants, and the town beach, as well as, easy access to transportation to the rest of the Island. An added advantage of the Lambert's Cove Hideaway is the inns proximity to the incredible Lambert's Cove Beach. Our combined 10 guestrooms, provide private baths, inside and outside sitting areas where you can plan your days activities, or time to relax between trips to town, going to the beach, a trip to one of 100 walking trails, or numerous other activities. Guests can also enjoy our substantial breakfast, spa quality Turkish towels, robes, and high speed Internet access. The Clark House has a few rooms that can accommodate more than two people and will accept children above 12. The Lambert's Cove Hideaway is for adults only. While each Hideaway room is large, we are limiting occupancy to two people. Neither property will accept pets and smoking is prohibited at both locations.